Two moons travel the heavens of Oberyon; the silver moon, Volorus, and her pale blue daughter, Onari. The moons have special significance for many cultures across Oberyon, yet few hold them as close to their hearts as the calterians. The symbol of the crescent and the circle adorns everything from their jewellery, to their architecture, and even their tools and weapons. The calterians call the silver moon the ‘Night Mother’ and the smaller moon the ‘Daughter’. This terminology has since spread across Oberyon and now the ‘Mother’ and the ‘Daughter’ are common terms in many cultures. In the Circle of Kingdoms the moons are named Volorus & Onari, although they are more commonly referred to as the ‘Greater’ and ‘Smaller’ moons respectively. 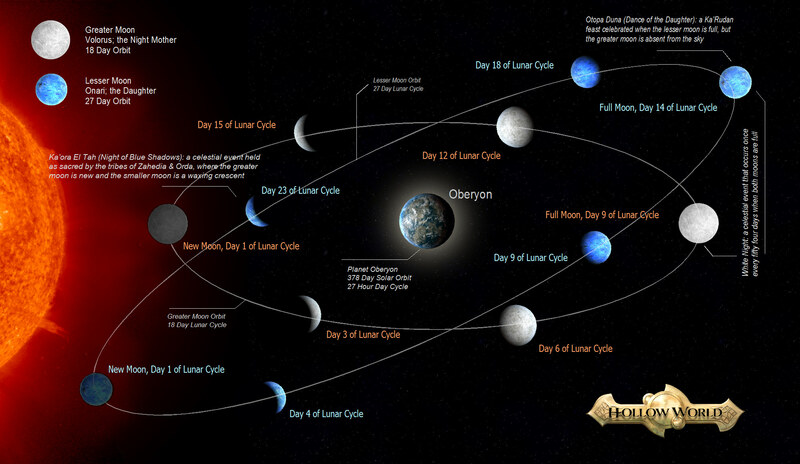 The greater moon has an eighteen day orbit, while the smaller moon takes twenty seven days to make its circle of the planet. White Night: a celestial event that occurs once every fifty four days when both moons are full. Otopa Duna (Dance of the Daughter): a Ka’Rudan feast celebrated when the lesser moon is full, but the greater moon is absent from the sky. Ka’ora El Tah (Night of Blue Shadows): a celestial event held as sacred by the tribes of Zahedia & Orda, where the greater moon is new, and the smaller moon is a waxing crescent. Subscribers get exclusive access to unpublished chapters from Heir Of The Hunted and get to start reading all Hollow World books for free.